AHD Notification is out. AHD is recruiting for 22 Fisheries Prison Supervisor Govt Job Posts. 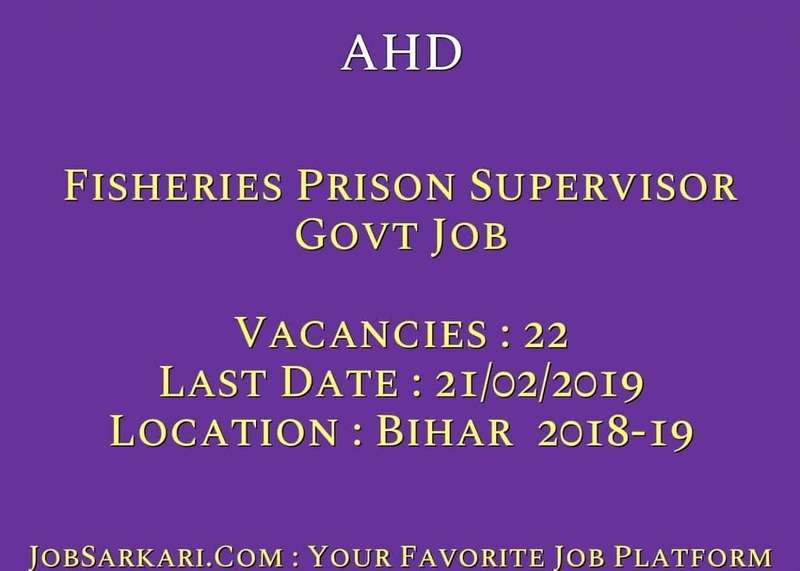 You can check AHD - Animal and Fisheries Resources last date, download AHD notification, visit AHD official website and check other AHD Vacancy details.Complete Vacancy and recruitment Details about 22 Fisheries Prison Supervisor Govt Job vacancies in AHD are provided below by JobSarkari.Com only for you. Last Date of Receipt Application Form. 21/02/2019. Fisheries Prison Supervisor. 11. 03. 06. 01. 01. 22. Candidate Must Have Passed B.Sc in Industrial Fisheries (Hons.) And Having 1 year PG Diploma in Inland Fisheries And 1 Year Certificate in Fisheries Administration And Management Course. Age Relaxation. 3 Years For OBC/ BC/ UR Female And 5 Years For SC/ ST.
4. Candidate Need to Send the Application Form on Given Address on or Before 21st February 2019. Director of Fisheries, Directorate of Fisheries, Officers Hostel, Block A, Beli Road, Bihar Patna- 800001. Q. What is the Last Date For AHD Fisheries Prison Supervisor Govt Job Vacancy ? A. 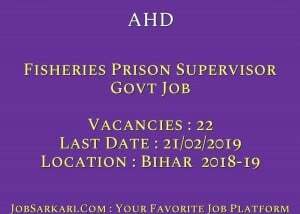 Last Date for AHD Fisheries Prison Supervisor Govt Job Posts is 21/02/2019. Q. What is the Form Type of AHD Fisheries Prison Supervisor Govt Job Recruitment ? A. The Form Type for AHD Fisheries Prison Supervisor Govt Job Posts is Offline. Q. How many vacancies are available in Animal and Fisheries Resources Fisheries Prison Supervisor Govt Job Posts ? A. There are about 22 Vacancies in Animal and Fisheries Resources Fisheries Prison Supervisor Govt Job Posts. Q. What is the Full Form of AHD ? A. Full Form of AHD is Animal and Fisheries Resources .